JumpFesta 2007: Jump chara and seiyuu here, there, everywhere!! 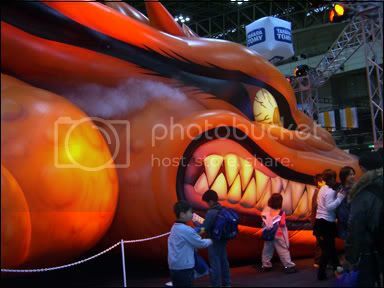 This weekend was JUMP FESTA 2007! The event was held at Makuhari Messe all the way in Chiba. It's a long and rather expensive train ride but if you love your JUMP comics, anime or seiyuu...it's WELL worth it. I attended the FESTA on both the 16th and 17th. I had intended to set out earlier on Saturday but due to my "sleepy" sister, we didn't get out there until the afternoon. Meaning, I missed the Naruto event at the Pierrot booth with Ishida Akira. :/ But oh well. Unfortunately my time was limited on Saturday since I was due to attend Kime's live at 5. So I only got to stay for 2 hours at the fest. But Kime's live was a blast so that made up for it. I DID attend the BLEACH stage at Pierrot f/ Morita Masakazu and Orikasa Fumiko. They talked about the new movie [BLEACH: Memories of nobody] coming out and even a little about Kubo Tite-sensei (who was there in the morning session). Their special guest was Saitou Chiwa who plays the character of Senna in the movie. Morimasa praised her to no end for her acting skills. Apparently the movie is supposed to be a real tearjerker. The cast did a "live advertisement" too. They read a script live for a movie trailer they had never seen before and which was made exclusively for JUMP FESTA. They did a great job! At the same time at the neighboring MMV stage, the TeniMyu cast were performing. Aiba, Minami and Sakurada were there. They performed a song from the myu and did their talk but I only saw part of it because the BLEACH event was about to start. My sis and I also passed an Eyeshield 21 event which Yamaguchi Kappei and Hirano Aya were hosting. On day 2. I saw a lot more people and did a lot more things since I got there earlier. I was really happy to see Miyata Kouki at the Bleach event promoting a Bleach video game as soon as I walked in. I dunno if he was a surprise guest because I didn't see him mentioned in the program. So it was a nice surprise. Actually that's what I love about JUMP FESTA, you never know whose going to show up because they often have guest seiyuu who aren't noted to appear. There were a lot of events that were going on at the same time today so I was going back and forth through the buildings ALOT. 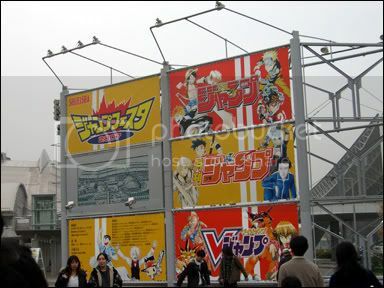 So to sum it up here are the events I went to BLEACH, NARUTO, DEATH NOTE, TENIMYU, TENIPURI, BUSOU RENKIN, MONSTER HUNT, ONE PIECE, EYESHIELD 21, and MAJIN TANTEI NOUGAMI NEURO. The seiyuu and actors I saw: Fukuyama Jun, Inoue Kazuhiko, Takeuchi Junko, Morita Masakazu, Orikasa Fumiko, Sugiyama Noriaki, Toriumi Kousuke, Miyano Mamoru, Yamaguchi Kappei, Irino Miyu, Yuzuki Ryouka, Midorikawa Hikaru, Yusa Kouji, Ueda Kana, Isaka Tatsuya, Satou Miki, Miyata Kouki, Itou Kentarou, Minagawa Junko, KenKen, IRE, Shindou Gaku, Kiriyama Ren, and Kiuchi Hidenobu. Unfortunately, I missed out on Kaida Yuki and Suwabe Junichi yesterday. And coincidentally, at some of the events some seiyuu were standing around me. One of the notable actors was TUTI. He was standing next to me when I went to watch the One Piece event, somewhat of a kiddy musical production. I did a double take when I noticed he was standing there. Well, I've got tons of freebies now. I took almost everything people were passing out. So I know I have at least a few new JUMP posters to decorate my room with. Anyhow, here are more pics from the FESTA! 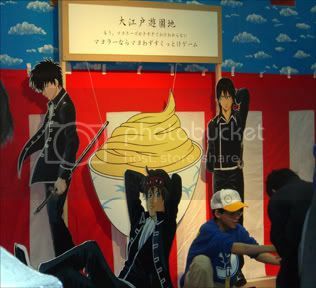 What's a Gintama display without mayo! 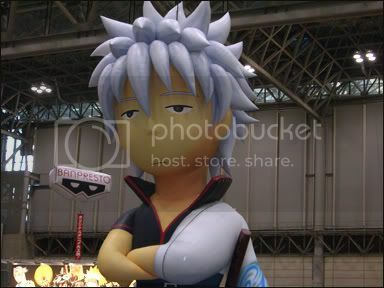 Gintoki looks so... excited. :D What series is he from? These pictures are awesome. Looks like it was fun! WAH! 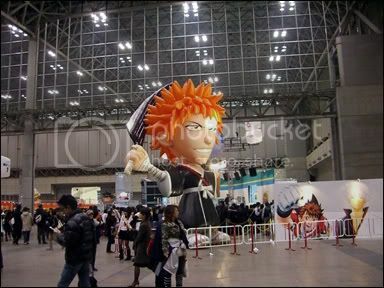 I so wanna go to JUMP Festa. .T_T I know they were selling Atobe's Jet Drive single there.... Man, I hope Kinokuniya gets my copy soon. Too bad you missed Suwabe. We definitely need to go to seiyuu events together next year!!! PS Do they only have JUMP Festa in winter? 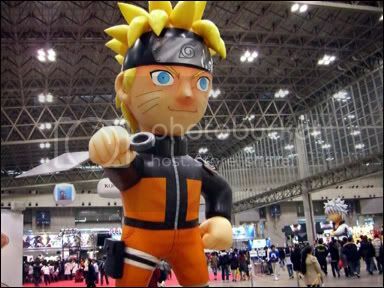 Yeah, unfortunately, JUMP FESTA is only in winter. I dunno if this is true for every year but the last 2 years that I've been going, it always seems to be the weekend before Christmas weekend. Yeah, that's Gintoki from Gintama!^^ The manga is hilarious, I highly recommend it! He's the type of character who always seems uninterested so hence the look of boredom. It was a lot of fun. I kinda wish they had it twice a year but I guess it's so anticipated because it only happens once a year. I kind of feel bad for the seiyuu who have to run from booth to booth and sometimes promoting more than one series/character. I bet their heck-a-tired by the end of the day. It was nice to see yusa and fukujun. Last time I saw them live was at last year's Soul Sonic event. I really should make it a point to attend more seiyuu events. I want to go to a Code Geass event if they have one with Fukujun and Sakupyon together! That would be awesome! Or even one for the Code Geass radio show with Sugiyama and Fukujun would be cool! Man, I'm so jealous you saw both my favorite seiyuu-tachi and Tenimyu actors~ ¬_¬ Too bad you missed out on both Kaida and Suwabe, though ._. Yeah, its always so much fun. It's great all your fav. manga, seiyuu, anime, games and freebies in one place. And so many different events going on all at once. Who wouldn't enjoy it?